Infinispan is an open-source, ASL 2.0-licensed, in-memory data grid platform based on Java 8. 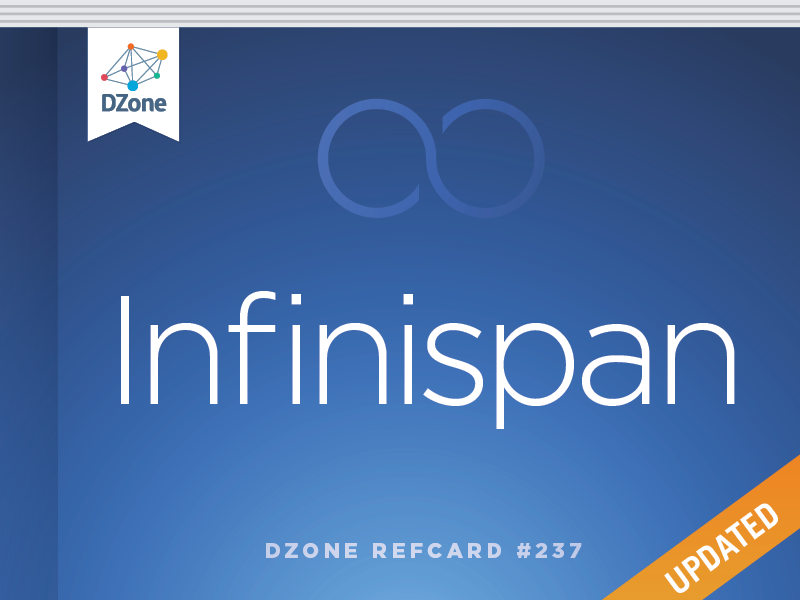 This newly updated Refcard offers tips for implementing Infinispan, gives a practical example for using it in embedded mode, and lists key APIs and cache features. Learn more about running Infinispan in containers and how to integrate the platform with Hibernate ORM, Apache Hadoop, Apache Spark, and Apache Camel. ► How Can I Get It? Infinispan is an open-source, ASL 2.0-licensed, in-memory data grid platform. In-memory data grids are commonly used as low-latency, highly available and elastic data storage backends, often as NoSQL solutions. A common use is in addition to traditional databases, as a distributed cache for fast data access. Infinispan can be used either embedded in your application, or remotely, via an efficient high-performance protocol known as Hot Rod, or over more ubiquitous protocols like Memcached. Your choice on which mode of interaction to use will depend on a number of factors, including whether you are using Infinispan as a clustering toolkit to cluster your own framework, whether you intend to use Infinispan to cache database lookups, or whether you plan to interact with Infinispan from a non-JVM environment. You can interact with Infinispan directly through its rich API, or use one of several integrations such as JCache, Spring Cache, and CDI. Depending on how you intend to use Infinispan, there are different ways you can download it. If you are embedding Infinispan in your application, the most convenient way is to use Maven. If instead you prefer to manage your project dependencies by yourself, or you want to use Infinispan Server, head over to http://infinispan.org/download/ to download your preferred distribution. When used in this mode, Infinispan instances reside within your JVM alongside your code. You start up multiple instances of your application on different servers and each one starts and initializes an Infinispan instance. These Infinispan instances discover each other, form a data grid, and start sharing and distributing data. This mode is what you will want to use if you want an in-memory cache (either local or clustered) to front a database or some other expensive data source or if you are building an application or a framework that needs to be cluster-aware. To see this in action, make sure the Infinispan libraries are available to your code—either via Maven, as above, or via downloading the zipped distribution and extracting the JAR files. Infinispan’s core construct is an instance of the Cache interface. Extending java.util.concurrent.ConcurrentMap, Cache exposes well-known methods to store and retrieve objects. Important: Infinispan’s clustering is implemented on top of the powerful JGroups library, which supports a large number of discovery protocols, depending on your environment. Check it out at http://jgroups.org. org.infinispan.configuration.cache.ConfigurationBuilder The cache configuration builder, used to programmatically define the features of each cache. org.infinispan.configuration.global.GlobalConfigurationBuilder The cache manager configuration builder, used to programmatically define global features such as thread pools, clustering, etc. By default, queries will apply the predicates to all of the entries to find matches. You can also enable the use of Lucene indexes which will provide a significant performance boost along with a bunch of additional features. but be aware that this will increase cluster traffic considerably. Note that cluster listeners only support POST observation. The code you run doesn’t necessarily need to interact with the caches themselves. Infinispan offers four caching modes: local, invalidation, replicated, and distributed. All of the modes support all of the features described above. For each of the clustered modes (invalidation, replicated, and distributed) you may choose whether you want communication between the nodes to be performed synchronously or asynchronously. Synchronous mode is slower, but safer, since write operations wait for completion on the remote nodes before returning. If you want more performance and can afford potentially losing writes on other nodes in case of failures, use asynchronous mode. performs the usual "word count" on all values of a cache. On a distributed Infinispan cache this will run in parallel on all nodes, using all the computing power of your cluster. You may not always want Infinispan instances to reside in the same JVM as your application. Sometimes this is for security, sometimes for architectural reasons to maintain a separate data layer, but this can also be because your client application is not on a JVM platform. For example, Node.js, C++, or .NET clients can also make use of Infinispan if it is run as a remote server. At this point you can connect to the console by using the URL http://localhost:9990 in your browser. The Hot Rod protocol has been designed specifically with load balancing and failover in mind. Clients can be written to take advantage of the server topology that is provided to clients and regularly kept up-to-date. Clients can even be made aware of hash functions used on the backend, so routing requests to a cluster of backend nodes can be done in an intelligent fashion to minimize latency and remote lookup on the backend. All of the available clients (Java, C++, .NET, and Node.js) make use of such features and provide built-in load-balancing, failover, discovery of new backend nodes, as well as intelligent routing of requests. If you need to share data among different languages/platforms, the use of a common marshalling format is recommended. While Infinispan does not impose a default, one option is ProtoBuf, a compact format with wide support. If you like running your applications in containers, Infinispan comes with a well-maintained container image that makes it easy to run Infinispan Servers in clustered, domain, and standalone modes, with different protocol stacks. docker exec -it $(docker ps -q -l) /opt/jboss/infinispan-server/bin/ispn-cli.sh -c "/subsystem=datagrid-infinispan/cache-container=clustered:read-attribute(name=members)"
The above examples will use UDP Multicast to perform discovery and cluster communication. If, however, you’re running in a cloud environment or another environment that does not allow the use of multicast, you can use the JGroups Gossip Router as an alternative discovery mechanism. Employing a gossip router will enable discovery via TCP, where the router acts as a registry: each member will register itself in this registry upon start and also discover other members. Infinispan can share data in lots of interesting and powerful ways. This Refcard only skims the surface of what can be achieved with Infinispan. For additional information, tutorials, examples, etc., please refer to the Infinispan website at http://infinispan.org. Tristan Tarrant is the lead for the Infinispan project. Starting with a background in computer science specializing in parallel architectures, he has been involved in the design and implementation of software architectures for customers at all scales. An active contributor to JBoss Community and other open source projects for many years, he is a passionate advocate of open source and open standards. GlobalConfigurationBuilder global = GlobalConfigurationBuilder.getClusteredDefault();\nConfigurationBuilder config = new ConfigurationBuilder();\nconfig.clustering().cacheMode(CacheMode.DIST_SYNC);\nDefaultCacheManager m = new DefaultCacheManager(global.build(), config.build());\nCache<String, String> cache = m.getCache();\ncache.put(\"hello\", \"world\");\ncache.containsKey(\"hello\"); // returns true\ncache.get(\"hello\"); // returns \"world\"\ncache.remove(\"hello\"); // returns \"world\"
performs the usual \"word count\" on all values of a cache. On a distributed Infinispan cache this will run in parallel on all nodes, using all the computing power of your cluster. docker exec -it $(docker ps -q -l) /opt/jboss/infinispan-server/bin/ispn-cli.sh -c \"/subsystem=datagrid-infinispan/cache-container=clustered:read-attribute(name=members)\"